I’m afraid that this week’s blog will take a bit of a departure from its usual form. I’m not writing this to inform, educate or entertain, and yes, I do usually try and blog to the BBC’s exacting standards. This week, I’m attempting to use my blog as therapy. To save me from boring you all with my dilemmas and thoughts, I am going to attempt to throw them all down on this piece of paper in the hope that I will feel lots better, without having to go through the embarrassment and pain, which so often comes with therapy. I suspect that the standard of my writing may take a dive in this departure from the norm; who would allow a sentence as long as the last, for example? As you may have guessed from knowing me at any point in the last twenty three years or even from reading my blog in the last few months, my life revolves around horses. I’m not hugely competitive; I’m aware that there is a limit to my talents and I’m happy to enjoy it for what it is. People say that a dog is a man’s best friend, but the relationship between a horse and rider is something quite special. It takes time, strength and patience to build that relationship, but once it’s there, it never goes. Robert Smith said “there is no secret so close as that between a rider and his horse” and he’s right. That’s why we do it. If you watch a combination who know each other very well, it will look like the rider is doing nothing, but in actual fact, they are working in harmony. That’s what we all aim for and that’s the joy of doing it. There is another great thing about the relationship between a person and their horse; they make a great psychiatrist and all they cost is the price of food and hay. Spending a couple of hours riding your horse takes away all the troubles in the world. It can be both the best and worst thing in the world; you are entirely alone with your thoughts and you’ve got to battle them out. I guess that it’s the same for people who go running or cycling – it’s just you and your mind. Sometimes we can’t cope with our thoughts for that long, so we block it out with music. Everywhere you look back through history, horses are celebrated; an old proverb says the winds of heaven can only be found blowing between a horse’s ears and they are right. Half a tonne of raw muscle, power, grace and poise between your legs isn’t something you’d get from a hamster or guinea pig. I can talk about the wonderful characteristics of these glorious, intelligent creatures until I’m blue in the face, but I know that not everyone agrees with me. There are those who believe that sports such as racing and eventing are unnecessarily dangerous and cruel. I always come back with the same argument; you take a horse onto the gallops and feel how they behave. They are excited and impatient to get going. It is in their nature to run and they love it. A horse is eleven hundred pounds of muscle and power so if they don’t want to do something you aren’t going to make them! Another part of having horses is the society and camaraderie that it brings with it. As a kid I was well used to missing out on things because we spent the weekends horsing around and competing. You would always see the same people at shows and at pony club. Sure, some faces changed, but there were some that have been around forever. I joined the pony club when I was about three years old and at the age of six, I clearly remember asking my instructor if I could have a different colour felt yet? Each year at camp, we would take an efficiency test. The first is your D test, then your D+, C, C+ etc. With that, you would receive a different colour felt to put on your jacket. According to my mum, I went home complaining that I had got my D test three times and why couldn’t I take my D+? I had to have it gently explained to me that most children hadn’t gone to Pony Club camp three times by the age of six. I have so many happy memories at shows and in pony club and sure, some friends have come and gone, but there is always the same core group. I remember being taught about balance whilst trotting, by holding a cup full of water, then everyone except me getting food poisoning from some tuna bake; I knew tuna was dangerous stuff and this just confirmed my worst fears. Then when I was a little older and put in charge, I attempted to cook scrambled egg for 30 children without adding milk. It resembled a chopped up, burnt omelette. I’ve had endless whip fights, dunking people into water troughs, getting dunked into water troughs etc. Basically, it’s all very Enid Blyton, but it was wonderful. It was a time before mobile phones and facebook. We would clean our tack outside the caravan whilst listening to Now 34 on my tiny stereo. In the last couple of years, I have been quite a done quite a lot for High Wycombe Riding Club and it’s really odd; it’s like going back to Pony Club. It’s the same old faces in the same old places. Horses have allowed me to have a fairly idyllic upbringing and gained some great friends along the way. So it seems so cruel that horses are currently responsible for ripping one of those dear friends from our clutches. As we grow up with our horses, we know that falling off is a huge part of the learning process; it’s character building. We know that there are risks inherent in our sport and we chose to do it anyway. It’s a bug and you love it. You are aware that people can get seriously injured, but you tell yourself that is at the top level of competition and not the weekend riders like ourselves. Equally much, we could get hit my a bus crossing the street. But last weekend one of those people I have been riding and pony clubbing with since I was about three had an accident. She’s an extremely competent jockey, the horse just slipped on the ground and the impact was obviously too much for her. At the moment, she is sleeping and her body is doing overtime readying itself for her to wake up. She is a big part of my childhood; I remember one year at the AGM aged about seven, we had to dress up as the perfect Pony Club person and the worst. I think we were both desperate to be the scruffiest and we made ourselves dirty with such relish! It just hurts me so much that something that is such a big part of my life can do so much damage. The way the accident happened meant that it could have happened to any of us. We are all as vulnerable as each other. Life is delicate and we hang on to it by a string. How are we meant to react to something like this? Is it meant to tell us that life is delicate and we should be really bloody careful? Or that we only get one life, so live it? I’m not sure. But I tell you what, I’m in the process of buying a Point Two Air Jacket. I might look like a prize idiot doing Pre Novices and Riding Club events in such an expensive piece of kit, but it will give me peace of mind. In the meantime, all of my thoughts, hopes and prayers are with Laura. She’s a massive part of the Riding Club, a great team mate, a fantastic laugh and always a good mate to have around. It seems so cruel that someone so vibrant should be clinging onto their life. Laura is one of the strongest, funniest and nicest people I have the pleasure of knowing and if anyone can pull themselves through this, it’s Lor. I’m afraid I haven’t proofread and even reread this weeks blog. It’s not really intended to be a masterpiece, just a little rant about the unfairness of life. A couple of weeks ago, I was set some “homework” by top notch comedy compadre and super sleuth Jo. In order to make her blog more exciting, Jo decided that she should have a radical rehaul of her “about me” page. What better way to portray yourself than through the words of others? Unfortunately, I think that it sits quietly with the odd excerpt from school reports, so she has dragged SuperBry in to offer her opinions. Now, to the best of my knowledge, our little Jolene Claire Eden popped into this world on the 16th October in 1986. I didn’t have the pleasure of knowing her until 2005, but I think that, except for the occasional episode of being locked in the shed, Jolene’s childhood was very similar childhood to all of us late 80s kids. We were fickle in our affections flicking carelessly from Pigeon Street to Poddington Peas. Some of us loved What a Mess whilst others were glued religiously to Playdays. But there is one thing that pulls us all together; we know that Barney was a dog, not a dinosaur. Even at a young age, we were connoisseurs and watched adult television – a Saturday night wasn’t complete without Crystal Maze, Gladiators and Blind Date. When we weren’t busy watching Rosie and Jim and Fun House, we would be bounding around the garden on a space hopper or attempting the perilous task of staying on a pogo stick. I first met Jo on one of the scariest days of my life. It was my first day at Uni. Nearly every other person was living in halls and had had the whole weekend to make friends with their new flatmates; I was living at home and commuting. The one thing I hated (and still hate) is feeling you have to justify this to so many people who think I’m strange and introverted. The simple truth of the matter is that I wanted to have my cake and eat it. I have horses and cannot imagine not riding every day and competing at the weekends. I couldn’t sensibly go away to uni and afford the upkeep of my horses, so I compromised; as the irritating meerkat would say “simples.” But quite why I have to explain this to people in job interviews is quite beyond me. Anyway I digress, but it’s safe to say I was feeling pretty nervous about the whole affair. There were so many freshers starting at Reading on that day that it seems strange I should have met Jo on this occasion; although the odds were enhanced by the fact we were both standing in the A-I queue. Incidentally, I had very few friends with surnames from the latter half of the alphabet. As her friends were going to their intellectual, law based things we went and sat on the grass outside HUMSS (which was to become something of a habit over the next four years) and talked about everything and nothing. I don’t remember what we talked about or what we had in common, but we’ve been stuck together ever since. In our first year, we didn’t share any seminars and were only in half our lectures together, but bonded by a common interest for making lectures that bit more exciting, our friendship formed. During our time at uni, Jo took on a number of different guises, but the primary one was that of a student. She wouldn’t like me to say that she was a gambler or particularly competitive, just that she wins a lot. She perfected this skill at uni between lectures (and I’ll be honest here, sometimes during lectures as well.) If you couldn’t find our little gang, it could be fairly much guaranteed that we would be playing a game of pool on the wonky tables where Waterstones is now, or huddled round an IT Box in the Union desperately throwing our student loan away. To this very day, we still get drawn to an IT Box if it comes lurking into view. Jo has struggled through adversity to continue her winning and gambling ways; her age will always let her down. I do remember a time when she was refused sale of a lottery ticket on account of her age. Unfortunately, she was 21 at the time. Then just last week, we went into a Tote Sport and the manager kindly asked her if she could wait outside whilst her mum put the bets on. Still, with a natural repellent like that, she might manage to cling on to a few pounds. Back in the day, Jo and I bonded over a love of Green Wing; it was quite obsessive and we loved it. There was nothing better than to grab the dvd and practically mouth the lines along with it. But we also went through a steep learning curve together with Green Wing. For those that know the programme will know what I mean; Series two. It was quite heartbreaking to see something you love going into self destruct in front of your very eyes. After that, we would share a common love for all things funny. Combined with a love of roadtrips, we went to a Spaced marathon and saw the whole cast including Colin the dog (God rest his Soul). We even went up to the home of cinema, the Prince Charles Cinema, and watched the Grindhouse double bill, which was introduced by Edgar Wright and the lovely, lovely Jessica Hynes was there too. Nowadays, Jo is a far more committed comedy compadre than me; she travels all the way from Nottingham at least once a month to go to the Comedy Store and crams as many other live shows in as possible. There is nothing better than sitting in the Mecca of Comedy. The Comedy Store, with good friends waiting for the show to start. This weekend, Jo is coming down to see Paul Merton’s Impro Chums, then some theatre and a trip to the Globe. God, we almost sound cultured. Similar to the role of Comedy Compadre, Jo has an encyclopaedic knowledge of all things musical and unlike anyone else I know, she has a chance of filling her 80GB iPod. Regardless of the genre of song, I bet you that Jo will know it. Or at least some inane fact about it. I remember many road trips singing along to anything and everything, particularly Jet and the Kinks! All in all, Jo has been a very good mate and all round top bird. There are so many lovely stories I could tell, but time and your interest restricts me there. She has taken on many other guises, like Jo the French Spy, which later developed in the Super Sleuth. Basically, if you ask something of Jo, she’ll try her damned best to do it. Well, as long as it’s after 11am anyway. And you’ve plied her with coffee. Oh, and you don’t mind her being a little late. But whatever the emergency (taking the earlier restrictions into account), you can guarantee that she’ll have something to help in the massive suitcase that she always overpacks for a few nights away. In a moment of ill advised good will, I decided that the best thing to do would be a poem. Hmm, we shall see. And everytime I see her, I know she’ll bring a big case with all her clutter. Isn’t the joy of perfection the fun you have in failing? Forget your perfect offering, there is a crack in everything; that’s how the light gets in. Perfection is a bug, an illness, a disease that lives in everyone. Every time a new baby is born into the world, the parents are simultaneously struck by how irrefutably perfect this little soft, peachy scrumple of skin is and at that moment, they will promise that their little urchin will become the most beautiful and intelligent person to walk this mortal coil. Once the little scrumple of skin wakes up and begins to develop a personality, the parents still find themselves desperately wanting to protect this innocent, untainted being. The first time they get a bump on the head or a cut knee, the emotional pain for the parent is a hundred times worse than the child’s physical pain; their precious child is no longer perfect. They have a little scar or bump, which you didn’t manage to protect them from. Obviously you cannot possibly protect children from every little scratch and that is a key part of their growing up and surely those scars aren’t a detriment to perfection, they actually make people individual and serve as a physical reminder of the formative events in their life. I have numerous scars about my body, but I can remember where most of them came from; the one across my wrist, where I had a small hand-eye coordination issue when using an axe, the ones across both knees where I misjudged the strength of a self made rope swing (over a road), another from a scooter brake failure, where I found myself embedded in a brick wall and the most recent was a high speed collision with a ditch and a tree in my car. Maybe in some people’s eyes, these are imperfections, but to me, they just make me who I am; slightly clumsy and easily coerced into harebrained ideas. We seem to seek out perfection in everything that we want. Horses are the classic example; save for ponies and small horses that have been outgrown, every horse is for sale for a reason. A horse is not like a Gameboy or a Wii, it is an animal, so like every person it will be slightly flawed. Regardless of talent or ability, nearly every rider wants a horse that is so talented and well tempered that they could take it round Badminton. By looking for the perfect horse with no flaws whatsoever, all you are doing is inviting the dealers and sellers to lie to you. A much better way of looking for the right horse is to find out what their problems are and see if they are ones you can live with. They say that love is blind, but I think that lust is blind and long term love/marriage is a real eye opener. I have owned Bea for three years and she may be a little long in the leg and short in the neck, but to me, she is beautiful. I never thought that I would own a coloured horse, I passed them off as pikey ponies and pantomime cows, but Bea is quite attractive; she has a slightly wild eye with a crooked blaze and big pricked ears that make her look really alert and interested in everything that is going on. These are certainly not signs of classic beauty, but to me, they match her personality perfectly and she wouldn’t be her without them. I was fully aware when I bought her, that she is not a good showjumper. But in a strange way, that pleased me – I knew why they were selling her. She is the most genuine and straightforward horse I have ever had the pleasure of owning; she can be a bit fizzy and excitable, but I completely trust that she would never intentionally put me in danger. Riding her through a dressage test or round a cross country course is like a dream, she just doesn’t quite jump the full height of the show jumps. If she was careful as well, I wouldn’t have been able to afford her. Maybe we should look at more things in this manner; it is not an imperfection or a flaw, it is a quirk, something that makes us an individual. We know that everyone is going to have things that irritate us; we just have to work out if it is something we can live with. I can live with Bea’s showjumping because she is so genuine and lovely in every other way. Maybe this is where I’ve gone wrong with men and to be honest, I blame the television. We spend our lives watching some of the most beautiful relationships unfolding in front of us, both on the big screen and the little one propped up between two chairs in the corner of the lounge. My shelves are adorned with books, videos and dvds based on this fantastical relationships; Lizzy Bennett and Mr Darcy, Monica and Chandler, Spaced’s Tim Bisley and Daisy Steiner, Nicholas Angel and Danny Butterman, Richard Hammond and Oliver. Then we go along and imagine that we deserve the perfect person, but everyone has a flaw. Mr Darcy? He was an arrogant sod. Monica? Could you live with someone that clean? What about Tim and Daisy? How many episodes of Spaced did you watch before you saw either of them working? Even Oliver was old, rusty and sickly, but the important thing was that he tried. He had heart. Well, ok a metal engine, but it still beat like a little heart, like a soul. So I suggest when God (or whatever other fictional force was stood by the oven creating us) is updating his designs on men, he should turn to the likes of Jane Austen, Richard Curtis, Stephen Moffat, David Krane, Marta Kauffman, Simon Pegg, Edgar Wright and Jessica Hynes. There are so many writers who have perfected the formula, so why hasn’t he? When I was really little, I believed that Neighbours was real and they were watching us in Australia; but then I also thought that sheep had two long legs and two short legs (on account of the hilly nature of their fields). But picture for a moment that we live in this surreal Bryniverse where Neighbours is real and sheep are incredibly wonky; imagine the let down for the poor Aussies who are watching our lives. We can never be as good as our fictional counterparts, but we do have one thing over them; they are fictional. We all have our problems and our flaws, but we are real, and in our parents eyes, I expect we are perfect. Some of the time. If we lived in this tv land and I were perfect, I would have gone to Oxbridge and not met some of the most entertaining, lovely and loyal friends. If I were perfect, I would have known better than to go to see the new Alice in Wonderland film, but I would have missed out on the giggling and fun of detesting it in company. If I were perfect, I would never have spent all of my seminars showing off and making smart arsed comments. If I were perfect, I wouldn’t have played taxi driver to three of my bosses last night (and then given them Anadin for their sore heads this morning). If I were perfect, I would not have had all the fun competing my pony, regardless of the results. All in all, I’m absolutely bloody delighted I’m not perfect because I’ve had so much fun along the way. Advertising is the one of the most profitable forms of writing, beaten only by ransom notes. There are a lot of different ways to look at advertising. At best, it is a beautiful blend of cleverly crafted wordsmithery and at worst, it is little more than an ostentatious display of clashing clothes all desperately jostling for attention. I am not sure that advertising ever actually sells a product. Yes, it certainly raises awareness and sells the company values, but I am not sure that anyone would ever see an advert and be so inspired by it, that they would rush out and buy the product. More likely, you will hear that irritating tune of Sheila’s Wheels and you would unconsciously ram your car into whatever stood in it’s path in a fit of rage, thus writing it off. Having said that, d espite having no desire whatsoever to own a BMW, their adverts do make me want to reconsider all my beliefs. Every year, they come up with the most amazing and groundbreaking ideas that no other car company comes close to. 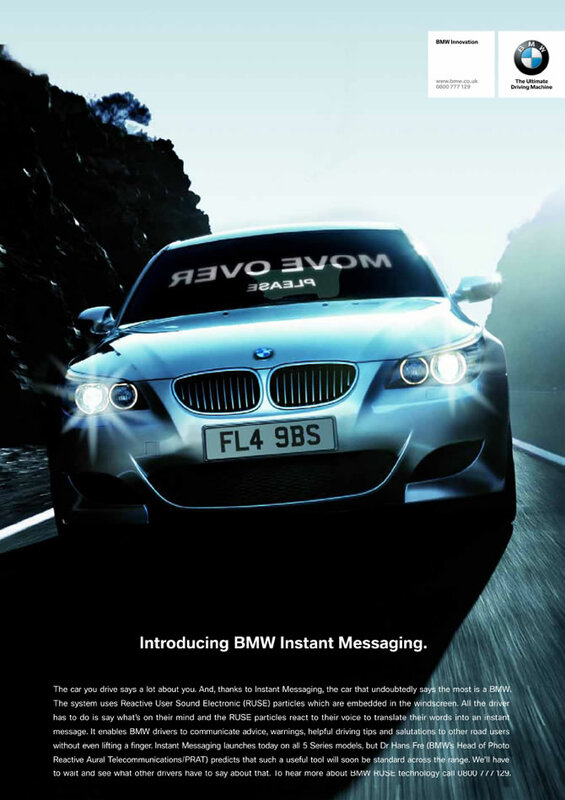 Apart from those smug BMW drivers out there, how many of us have actually driven in a car that has inbuilt instant messaging? Think of the times you are following a car crawling down the fast lane, completely oblivious to the oblivion of fury building up behind them? You know that you shouldn’t drive up their arse, but what can you do? Well, BMW invented a system to avoid such road rage. With your BMW Instant Messaging, you can share an inoffensive and polite warning to the driver in front that they are causing a holdup. This multipurpose system does not just stop road rage, it also helps to prevent traffic jams and pile ups as conscientious drivers can now warn oncoming traffic about queues and accidents ahead. This system was first designed in 2008 and the effects it has had on road rage has been incredible. I’m just waiting for Hyundai to come up with a similar system for my car. However, in the meantime, I carry a pad of A3 paper and a magic marker for just such an occasion. BMW’s designs are not only designed to make your driving safer, they also serve to make your car a nicer environment to be in. 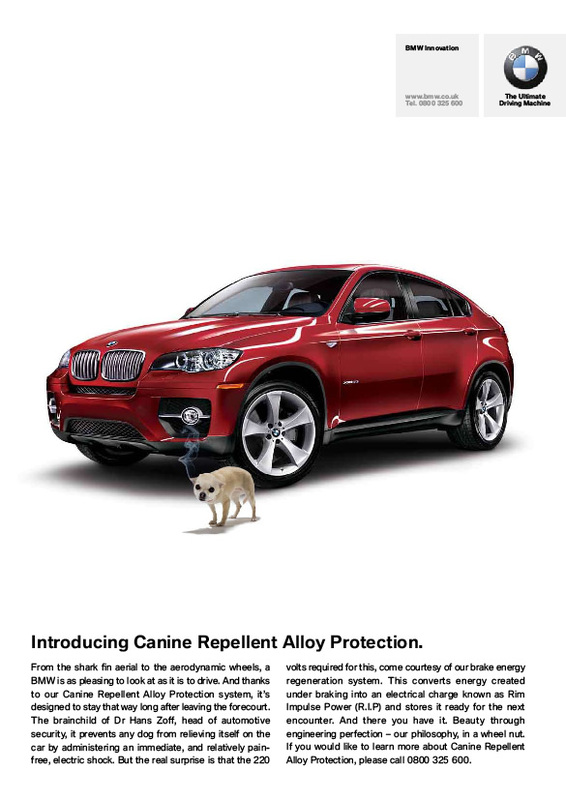 The Canine Repellent Alloy Protection speaks for itself really, but for those who need a little more introduction, it stops those nasty little blighters from spoiling your alloys. Although it may seem cruel at first, dogs are very intelligent animals and they only need one little electric shock to teach them to distinguish between BMW’s and lesser (presumably piss covered) cars. As is often the case, I have suffered hugely from my cheaper and inferior technology; my hub caps are dirty and soiled, the metal mechanics of my wheel are rusted and falling to pieces and all because I don’t own a BMW. My dog has learnt that the next door neighbours Beamer is a no go area, which quite frankly has made mine more of a target. If only I owned a BMW. BMW have had a lot of criticism for not being a green and environmentally concerned company and 2009 was the year they aimed to change that. With the Magnetic Tow Technology, you could simply cut your engine and continue your journey at the press of a button. 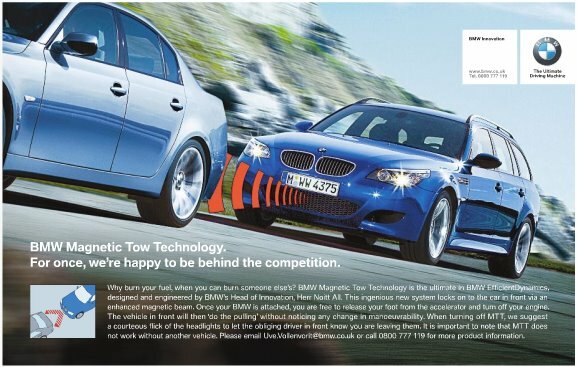 The 2009 range of BMWs are fitted with strong magnets beneath their grills so that they can “catch a ride” from the car in front, thus saving you fuel and lessening your carbon footprint. This amazing innovation is something I have tried to replicate, but short of fitting a tow hitch to the front of my car, hooking up to an unsuspecting person in a petrol station and praying they are going my way, I have failed. Time and time again, we are seeing just why BMW are market leaders and Hyundai are trailing some way in the distance. BMW are constantly working to be innovative and ahead of the times and it is with this in mind that they released their latest technology. 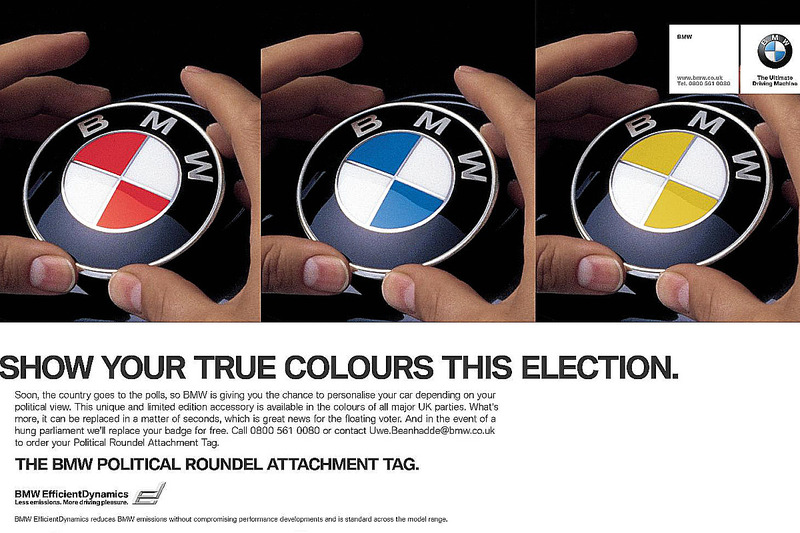 The Political Roundel Attachment Tag. With an upcoming general election, our politicians are desperately trying to sweep the nation into a political frenzy and what better way to show your allegiance than on your car? With this prominent badge, you can drive around comfortable in the knowledge that you are supporting your favourite political party. The Political Roundel Attachment Tag is easy to fit and as such, easy to swap or change should you have a sudden change of heart. This is an ideal feature for the floating voter as they can change the badge as much, or as often, as they like. For those who know me, know that I travel in a slightly inconspicuous automobile. It is a lovely Hyundai Getz; small, compact and “hip hop red”. Many of you will have seen red cars before, but none that even come close to the hue of mine. It screams red as it crawls along the road with gusto and cheer and I’m not sure that this represents me politically. I wouldn’t say that I have been overly impressed with the Labour government of late, so driving a car that is screaming Labour is just another failing of the Hyundai brand, where BMW would have stepped in and smoothed my problems over for me. *There is a rumour that some of this may be an elaborate hoax. The worst winter I ever suffered was summer in Britain. As a society, we hold summer as this wonderful, much fabled, blissful time. A time when we sit on sun loungers, read literary classics that we’ve previously only bent the spines of (so as to appear well-thumbed to the discerning passer-by), get a glorious, yet natural sun tan and basically live the good life. How many of us think of summer as a time when we can invite the world round for a barbeque, where everyone will reminisce about times gone by and laugh whilst sipping at their Pimms? Of course, we must be realistic and remember that we live in the United Kingdom. We all fail to remember how just bringing the BBQ out of the shed will hit the automatic rain switch. Despite the many, many government adverts, we also forget that cooking chicken on a barbeque is an instant no no as everyone will peel open the meat and start searching, beady eyed, for a spot of pink to panic about. Another bone of contention is the idea of giving a group of people alcohol; there will be no witty or entertaining discussion, just tension as the group driver attempts to play UN peacekeeper between the ranks. Everyone dresses hopelessly optimistically in shorts, skirts, flip flops and other holiday paraphernalia completely forgetting that by day, they will be covered in insect bites and by night, they will freeze. Being British, the humble barbeque isn’t the only excuse we use to have a good drink, and let’s face it, summer drinking is so much nicer than winter drinking. In the winter, we hibernate in the dark corners of pubs whereas in the summer, we can sit in the garden drinking Pimms, which is practically healthy. Afterall, it provides at least three of your five fruit and vegetables a day. Another great love of the summertime is the festival. Despite going to university in Reading, I have managed to reach the age of 23 without having been to a proper festival. However, I have horses and often spend weekends away competing, so I understand the concept. In the months leading up to the event, you are filled with that dreamy romanticism of sitting outside your tent/lorry drinking Magners and watching the sun go down after a day of music/competition. In reality, it always rains and you hide inside your tent, which is by the way far wetter on the inside, swigging from a tin of Strongbow. Life is never quite what you plan. This year, I will be going to the V Festival for my first experience. I have no preconceptions about it; I know it’ll rain and we’ll be wet, but I think I’m quite hardened to that. Shamefully I’m not a really musical person; I love listening to it, but I am so incredibly tone deaf and tone dumb that I can’t possibly understand it. Regardless of that, the lineup is full of bands that I like and I’m sure it will be a lovely relaxing weekend with great company. It strikes me as odd that everyone thinks that summer is so wonderful. It’s not like spring, which is alive with the buds and flowers shooting up (please, no drug jokes) or autumn where everything turns a wonderful golden, auburn colour and the leaves crunch underfoot. It’s not as though people look forward to the weather; if it’s too hot, they complain they can’t work in that heat and it’s not as though the British ever holiday in their own country. We would much rather fly three hours to sit on a beach surrounded by other British people, all trying to turn ourselves golden and ending up redder than that light you got caught driving through the other day. Our summers are very dry, so the grass turns yellow and dies, I don’t understand why people get sad in the winter and yet they are happy about the summer. I am not particularly affected by any of the seasons, I consider that I am fairly happy in all of them. However, my lifestyle changes dramatically depending on them. In the summer, I base my weekends around my horses. I love being outside as much as possible and I enjoy competing them. I am not as competitive as I was as a child, but I love going out and seeing my friends and sharing the show banter. In my current job, I have to work relatively long days (8.30 to 5.30), which isn’t a problem in the summer as I can still ride after work, but in the winter, I haven’t got a chance of riding more than two or three days a week. That takes the notion of competing out of the equation, so I have adapted my winter accordingly and spend time with another love of mine. Comedy. What better thing is there to do of a dark, wet winter’s evening than find yourself some comedy? Whether it’s a big well known comedian in a large theatre or a several unknown open spots in a tiny pub, it’s can be the best way to spend an evening. I still find time to go and see comedy in the summer, but it plays second string to competitions, whereas in the winter, it is the focus of the weekend. Like everyone in the world, I work to earn the money to do the things I desire and as such I live for the weekends. I always have something to do whether it is writing, watching new programmes, going to gigs or spending time with my horses it doesn’t matter what season it is. Summer tends to be so over-rated. The minute the clocks change, everyone expects the world to dramatically turn into summer. Well here I am, in the supposed summer time bunged up with cold, feeling terrible and spring cleaning my room. I could just as easily be doing that in the winter. Life is what you make it. You can’t let the weather and the seasons dictate your mood; it is up to you to find your happy medium.